How much costs you a full equipped round? Remember this table when you start to hunt your last opponent (e.g. 4vs1 situations). If you die unnecessary, you will lose A LOT money and probably can’t get full equipped next round or drop weapons for your teammates. 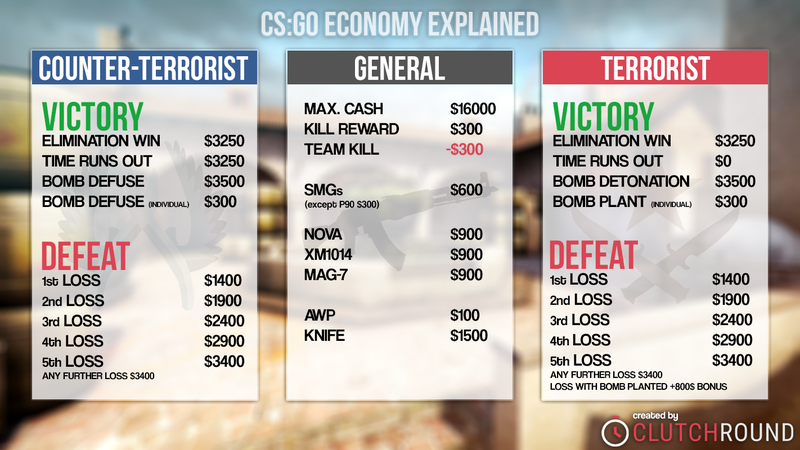 The money management of professional teams during their competitive matches is very complex and hard to explain for beginners. There are a lot of variables, which flow into specific decisions. We don’t want to simplify and generalize this topic too much – especially because we would like to present you some basic math for different kinds of rounds, so we will do a very detailed in-depth guide about more advanced money management together with some professional players. For this guide here, we would like to concentrate on some basic useful tips for beginners.